Corfu ( Latin: Corcyra; Italian: Corfx�) is a Greek island in the Ionian Sea. It is the second largest of the Ionian Islands. The island is part of the Corfu peripheral unit, and is administrated as a single municipality. 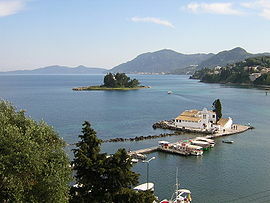 The municipality includes the island Corfu and the smaller islands Ereikoussa, Mathraki and Othonoi. The principal town of the island and seat of the municipality (pop. 33,886) is also named Corfu. Corfu is home to the Ionian University. The island's history is laden with battles and conquests. The legacy of these struggles is visible in the form of castles punctuating strategic locations across the island. Two of these castles enclose its capital, which is the only city in Greece to be surrounded in such a way. As a result, Corfu's capital has been officially declared a Kastropolis ("castle city") by the Greek government. Corfu was long controlled by Venice, which repulsed several Turkish sieges, before falling under British rule following the Napoleonic Wars. Corfu was eventually ceded by the British Empire along with the remaining islands of the United States of the Ionian Islands, and unification with modern Greece was concluded in 1864 under the Treaty of London. Picture - Map of Corfu. Its satellite islands of Ereikousa, Othoni and Mathraki counterclockwise NW, WNW and W respectively (with respect to the northern part of the island at the top of the map) and Paxoi and Antipaxoi on the SE side, are visible. Its north-eastern coastline lies off the coast of Sarandx�, Albania, from which it is separated by straits varying in width from 3 to 23 km (2 to 15 mi), while the south-east side of the island lies off the coast of Thesprotia, Greece. The name "Corfu", an Italian version of the Byzantine Κορυφώ (Koryphō), meaning "city of the peaks", derives from the Greek Κορυφαί (Koryphai) (crests or peaks), denoting the two peaks of Palaio Frourio. In shape it is like the sickle (drepanē, δρεπάνι), to which it was compared by the ancients: the concave side, with the town and harbour of Corfu in the centre, lies toward the Albanian coast. With the island's area estimated at 227 square miles (588 km), it runs approximately 40 miles (64 km) long, with greatest breadth at around 20 miles (32 km). Two high and well-defined ranges divide the island into three districts, of which the northern is mountainous, the central undulating, and the southern low-lying. The more important of the two ranges, that of Pantokrator (Παντοκράτωρ - the ancient Istone) stretches east and west from Cape Falacro to Cape Psaromita, and attains its greatest elevation in the summit of the same name. The second range culminates in the mountain of Santi Jeca, or Santa Decca, as it is called by misinterpretation of the Greek designation Άγιοι Δέκα (Hagioi Deka), or the Ten Saints. The whole island, composed as it is of various limestone formations, presents great diversity of surface, and views from more elevated spots are magnificent. Beaches are found in Agios Gordis, the Korission lagoon, Agios Georgios, Marathia, Kassiopi, Sidari, Palaiokastritsa and many others. Corfu is located near the Kefalonia geological fault formation; earthquakes have occurred. Corfu town and countryside have not lost the traditional architecture from the 16th century. Corfu's coastline spans 217 kilometres (135 mi) including capes; its highest point is Mount Pantokrator (906 metres (2,972 ft)); and the second Stravoskiadi, at 849 metres (2,785 ft). The full extent of capes and promentories take in Agia Aikaterini, Drastis to the north, Lefkimmi and Asprokavos to the southeast, and Megachoro to the south. Two islands are also to be found at a middle point of Gouvia and Corfu Bay, which extends across much of the eastern shore of the island; are known as Lazareto and Ptychia (or Vido). Camping areas can be found in Palaiokastritsa, Agrillia, with four in the northern part, Pyrgi, Roda, Gouvia and Messonghi. Homer identifies seven plants that adorn the garden of Alcinous: wild olive, oil olive, pear, pomegranate, apple, fig and grape vine. Of these the apple and the pear are As of 2011 very inferior in Corfu; the others thrive, together with all the fruit trees known in southern Europe, with addition of the kumquat, loquat and prickly pear and, in some spots, the banana. When undisturbed by cultivation, the myrtle, arbutus, bay and holm oak form a rich brushwood, and the minor flora of the island are extensive. The town of Corfu stands on the broad part of a peninsula, whose termination in the Venetian citadel (Greek: Παλαιό Φρούριο) is cut off from it by an artificial fosse formed in a natural gully, with a seawater moat at the bottom, that now serves as a marina and is called the Contrafossa. The old town, having grown within fortifications, where every metre of ground was precious, is a labyrinth of narrow streets paved with cobblestones, sometimes tortuous but colourful and clean. These streets are known as kantox�nia (Greek: καντούνια), and the older amongst them sometimes follow the gentle irregularities of the ground; while many are too narrow for vehicular traffic. A promenade rises by the seashore towards the bay of Garitsa (Γαρίτσα), together with an esplanade between the town and the citadel known as Spianada with the Liston (it) arcade (Greek: Λιστόν) to its west side, where restaurants and bistros abound. Picture - Corfu City Hall (previously: Nobile Teatro di San Giacomo di Corfx�). Picture - Palaio Frourio south elevation. The Venetian built moat is on the left and the Doric style St. George's Church built by the British can be seen in the background on the right. The new citadel or Neo Frourio (Νέο Φρούριο, "New Fortress") is a huge complex of fortifications dominating the northeastern part of the city; the huge walls of the fortress dominate the landscape as one makes the trip from Neo Limani (Νέο Λιμάνι, "New Port") to the town, taking the road that passes through the fishmarket (ψαραγορά). The new citadel was until recently a restricted area due to the presence of a naval garrison, but old restrictions have been lifted and it is now open to the public, with tours possible through the maze of medieval corridors and fortifications. The winged Lion of St Mark, the symbol of Venice, can be seen at regular intervals adorning the fortifications. Near the old Venetian Citadel a large square called Spianada is also to be found, divided by a street in two parts: "Ano Plateia" (literally: "Upper square") and "Kato Plateia" (literally: "Lower square"), (Ανω Πλατεία and Κάτω Πλατεία in Greek). This is the biggest square in South-Eastern Europe and one of the largest in Europe, and replete with green spaces and interesting structures, such as a Roman-style rotunda from the era of British administration, known as the Maitland monument, built to commemorate Sir Thomas Maitland. An ornate music pavilion is also present, where the local "Philharmonikes" (Philharmonic Orchestras) (Φιλαρμονικές), mount classical performances in the artistic and musical tradition for which the island is well-known. "Kato Plateia" also serves as a venue where cricket matches are held from time to time. In Greece, cricket is unique to Corfu, as it was once a British protectorate. Picture - The Palace of Sts. Michael and George (Palaia Anaktora). The gardens are to the right of the statue immediately after the arch to its right. The statue of Sir Frederick Adam, a British governor of Corfu, is at the front. Just to the north of "Kato Plateia" lie the "Palaia Anaktora" (Παλαιά Ανάκτορα: literally "Old Palaces"): a large complex of buildings of Roman architectural style used in the past to house the King of Greece, and prior to that the British Governors of the island. Today they are open to the public and form a complex of halls and buildings housing art exhibits, including a Museum of Asian Art, unique across Southern Europe in its scope and in the richness of its Chinese and Asian exhibits. The gardens of the Palaces, complete with old Venetian stone aquariums, exotic trees and flowers, overlook the bay through old Venetian fortifications and turrets, and the local sea baths (Μπάνια τ' Αλέκου) are at the foot of the fortifications surrounding the gardens. A caf� on the grounds includes its own art gallery, with exhibitions of both local and international artists, known locally as the Art Caf�. From the same spot, the viewer can observe ships passing through the narrow channel of the historic Vido island (Νησί Βίδου) to the north, on their way to Corfu harbour (Νέο Λιμάνι), with high speed retractable aerofoil ferries from Igoumenitsa also cutting across the panorama. A wrought-iron aerial staircase is also to be found, closed to garden visitors, descending to the sea from the gardens, and used by the Greek Royal family as a shortcut to the baths. 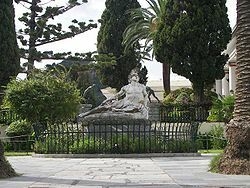 Rewriting history, locals now refer to the old Royal Gardens as the "Garden of the People" (Ο Κήπος του Λαού). In several parts of the old city houses from the Venetian era are to be found. The old city's architectural character is strongly influenced by the Venetian style, coming as it did under Venetian rule for a long period; its small and ancient sidestreets, and the old buildings' trademark arches are particularly reminiscent of Venice. Of the thirty-seven Greek churches, the most important are the city's cathedral, the church dedicated to Our Lady of the Cave (η Παναγία Σπηλιώτισσα (hē Panagia Spēliōtissa)); Saint Spyridon church, wherein lies the preserved body of the patron saint of the island; and finally the suburban church of St Jason and St Sosipater (Αγιοι Ιάσων και Σωσίπατρος), reputedly the oldest in the island, and named after the two saints probably the first to preach Christianity to the Corfiots. The nearby island, known as Pontikonisi (Greek meaning "mouse island"), though small is very green with abundant trees, and at its highest natural elevation (excluding its trees or man-made structures, such as the monastery), stands at about 2 m (6 ft 6.74 in). Pontikonisi is home of the monastery of Pantokrator (Μοναστήρι του Παντοκράτορος); it is the white stone staircase of the monastery that when viewed from afar gives the impression of a (mouse) tail which lent the island its name: 'mouse island'. Othoni (Οθωνοί) is the westernmost settlement and island in all Greece; Ereikoussa is the northernmost of the Ionian Islands, and all areas lie below the 40� N. About a quarter of the villages' names end with -ades, while some villages outside Corfu also include names ending in -ades, especially those in the prefecture of Ioannina on mainland Greece, exactly opposite the southern end of Corfu. Villages at the southern end, and on the Paxoi islands, also feature names ending with -atika or -eika, notably Gramateika. Lazaretto Island, formerly known as Aghios Dimitrios, is located two nautical miles northeast of Corfu; the island has an area of 17.5 acres and comes under the administration of the Greek National Tourist Organization. During Venetian rule in the early 16th century, a monastery was built on the islet and a leprosarium established later in the century, after which the island was named. In 1798, during the French occupation, the islet was occupied by the Russo-Turkish fleet, who ran it as a military hospital. During the British occupation, in 1814, the leprosarium was once again opened after renovations, and following Enosis in 1864 the leprosarium again saw occasional use. During World War II, the Axis Occupation of Greece established a concentration camp there for the prisoners of the Greek National Resistance movement, while remaining today are the two-storied building that served as the Headquarters of the Italian army, a small church, and the wall against which those condemned to death were shot. Corfu contains a few very important remains of antiquity. The site of the ancient city of Corcyra (Kerkyra) is well ascertained, about 1.5 miles (2 km) to the south-east of Corfu, upon the narrow piece of ground between the sea-lake of Halikiopoulo and the Bay of Castrades, in each of which it had a port. The circular tomb of Menekrates, with its well-known inscription, is on the Bay of Castrades. Under the hill of Ascension are the remains of a temple, popularly called of Poseidon, a very simple dome structure, which still in its mutilated state presents some peculiarities of architecture. Of Cassiope, the only other city of ancient importance, the name is still preserved by the village of Cassiopi, and there are some rude remains of building on the site; but the temple of Zeus Cassius for which it was celebrated has totally disappeared. Throughout the island numerous monasteries and other buildings of Venetian erection are to be found, of which the best known are Paleokastritsa, San Salvador and Peleka. The Achilleion is a palace commissioned by Elisabeth of Austria and purchased in 1907 by Wilhelm II of Germany; it is now a popular tourist attraction. Corfu Town is famous for its Italianate architecture, most notably the Liston (it) an arched colonnade lined with cafes on the edge of the Spianada (Esplanade), the vast main plaza and park which incorporates a cricket field and several pavilions. Also notable are the Venetian-Roman style City Hall, the Old and New castles, the recently restored Palace of Sts. Michael and George, formerly the residence of the British governor and the seat of the Ionian Senate, and the summer Palace of Mon Repos, formerly the property of the Greek royal family and birthplace of the Duke of Edinburgh. The Park of Mon Repos is adjacent to the Palaiopolis of Kerkyra, where excavations were conducted by the Greek Archaeological Service in collaboration with the University of Louvain-la-Neuve in Belgium, and Brown University in the United States. During World War II, the island was bombed by the German airforce, resulting in the destruction of most of the town's buildings, including its market (αγορά) and Hotel Bella Venezia. The worst architectural losses of the Luftwaffe bombardment were the splendid buildings of the Ionian Academy (Ιόνιος Ακαδημία), and the Municipal Theatre (which in 1901 had replaced the Nobile Teatro di San Giacomo). The Roman style Theatre (Θέατρον) of the city was later replaced by a bland, modern box-style building. Discussions have been held at local governmental level about demolishing this modern building and replacing it with a replica of the old theatre. In contrast, Ionian University reconstructed the Ionian Academy in all its former glory. Picture - Statue of Achillex�s Thnēskōn (Achilles Dying) in the gardens of the Achilleion. Empress (German: Kaiserin) of Austria Elisabeth of Bavaria, also known as Sissi, was a woman entranced by beauty. She lost her only son, Crown Prince Rudolf of Austria, when he committed murder-suicide in The Mayerling Incident of 1889. A year later, in 1890, she built a summer palace in the region of Gastouri (Γαστούρι) to the south of the city, with the powerful mythical hero Achilles as its central theme. The palace, with the neoclassical Greek statues that surround it, is a monument to platonic romanticism as well as escapism. It was named Achx�lleion (Αχίλλειον) after the Homeric hero Achilles. The structure is filled with paintings and statues of Achilles, both in the main hall and in the gardens, depicting the scenes of the Trojan War. The Imperial gardens on the hill look over the surrounding green hill crests and valleys and the Ionian sea. The centrepiece of the gardens is a marble statue on a high pedestal, of the mortally wounded Achilles (Greek: Αχιλλεύς Θνήσκων, Achillex�s Thnēskōn, Achilles Dying) without hubris and wearing only a simple cloth and an ancient Greek hoplite helmet. This statue was carved by German sculptor Ernst Gustav Herter. The hero is presented devoid of rank or status, and seems notably human though heroic, as he is forever trying to pull Paris's arrow from his heel. His classically depicted face is full of pain. He gazes skyward, as if to seek help from Olympus. According to Greek mythology, his mother Thetis was a goddess. In contrast, at the great staircase in the main hall is a giant painting of the triumphant Achilles full of pride. Dressed in full royal military regalia and erect on his racing chariot, he pulls the lifeless body of Hector of Troy in front of the stunned crowd watching helplessly from inside the walls of the Trojan citadel. In 1898, Empress Sissi was assassinated at the age of 60 by an anarchist in Geneva, Switzerland. After her death the palace was sold to the German Kaiser Wilhelm II. Later it was acquired by the Greek State. The Achilleion has been converted into a museum. Picture - Kaiser's Bridge in Corfu. German Kaiser Wilhelm II was also fond of taking holidays in Corfu. Having purchased the Achilleion in 1907 after Sissi's death, he appointed Carl Ludwig Sprenger as the botanical architect of the Palace, and also built a bridge to be named by the locals after him: "Kaiser's bridge" (Greek: η γέφυρα του Κάιζερ transliterated as: i yefyra tou Kaizer), to access the beach without traversing the road forming the island's main artery to the south. The bridge, arching over the road, spanned the distance between the lower gardens of Achilleion and the nearby beach; its remains, a monument to imperial vanity as well as impracticality, are an important landmark on the highway. The bridge's central section was, ironically, demolished by the Wehrmacht during the German occupation of World War II to allow for the free movement of its vehicles. Picture - A relief of Dionysus Bacchus at the Corfu Museum. The earliest reference to Corfu is the Mycenaean Greek word ko-ro-ku-ra-i-jo ("man from Kerkyra") written in Linear B syllabic script, ca. 1300 BC. According to Strabo Corcyra (Κόρκυρα) was the Homeric island of Scheria (Σχερία), and its earliest inhabitants were the Phaeacians (Φαίακες). The island has indeed been identified by some scholars with Scheria, the island of the Phaeacians described in Homer's Odyssey, though conclusive and irrefutable evidence for this theory or for Ithaca's location have not been found. At a date no doubt previous to the foundation of Syracuse it was peopled by settlers from Corinth, probably 730 BC, but it appears to have previously received a stream of emigrants from Eretria. The commercially advantageous location of Corcyra on the way between Greece and Magna Grecia, and its fertile lowlands in the southern section of the island favoured its growth and, influenced perhaps by the presence of non-Corinthian settlers, its people, quite contrary to the usual practice of Corinthian colonies, maintained an independent and even hostile attitude towards the mother city. This opposition came to a head in the early part of the 7th century BC, when their fleets fought the first naval battle recorded in Greek history: 665 BC. according to Thucydides. These hostilities ended in the conquest of Corcyra by the Corinthian tyrant Periander (Περίανδρος) who induced his new subjects to join in the colonization of Apollonia and Anactorium. The island soon regained its independence and henceforth devoted itself to a purely mercantile policy. During the Persian invasion of 480 BC it manned the second largest Greek fleet (60 ships), but took no active part in the war. In 435 BC it was again involved in a quarrel with Corinth over the control of Epidamnus, and sought assistance from Athens (see Battle of Sybota). This new alliance was one of the chief immediate causes of the Peloponnesian War, in which Corcyra was of considerable use to the Athenians as a naval station, but did not render much assistance with its fleet. The island was nearly lost to Athens by two attempts of the oligarchic faction to effect a revolution; on each occasion the popular party ultimately won the day and took a most bloody revenge on its opponents (427 BC and 425 BC). During the Sicilian campaigns of Athens Corcyra served as a supply base; after a third abortive rising of the oligarchs in 410 BC it practically withdrew from the war. In 375 BC it again joined the Athenian alliance; two years later it was besieged by a Spartan force, but in spite of the devastation of its flourishing countryside held out successfully until relieved. In the Hellenistic period Corcyra was exposed to attack from several sides. In 303 BC after a vain siege by Cassander, the island was occupied for a short time by the Lacedaemonian general Cleonymus of Sparta, then regained its independence and later it was attacked and conquered by Agathocles. He offered Corfu as dowry to his daughter Lanassa on her marriage to Pyrrhus, King of Epirus. The island then became a member of the Epirotic alliance. It was then perhaps that the settlement of Cassiope was founded to serve as a base for the King of Epirus' expeditions. The island remained in the Epirotic alliance until 255 BC when it became independent after the death of Alexander, last King of Epirus. In 229, it was captured by the Illyrians, but was speedily delivered by a Roman fleet and remained a Roman naval station until at least 189. 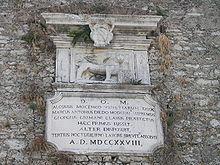 At this time, it was governed by a prefect (presumably nominated by the consuls), but in 148 it was attached to the province of Macedonia In 31 BC, it served Octavian (Augustus) as a base against Mark Antony. From AD 336 onwards, it was ruled by the Eastern Roman Empire. After the definitive division of the Roman Empire in 395, Kerkyra remained with the Eastern Roman Empire, later known as the Byzantine Empire. Eclipsed by the foundation of Nicopolis, Kerkyra for a long time passed out of notice. With the rise of the Norman kingdom in Sicily and the Italian naval powers, it again became a frequent object of attack. In 1081-1085 it was held by Robert Guiscard, in 1147-1154 by Roger II of Sicily. During the break-up of the Later Byzantine Empire it was occupied by Genoese privateers (1197-1207) who in turn were expelled by the Venetians. In 1214-1259 it passed to the Greek despots of Epirus, and in 1267 became a possession of the Neapolitan house of Anjou. Under the latter's weak rule the island suffered considerably from the inroads of various adventurers; hence in 1386 it placed itself under the protection of Venice, which in 1401 acquired formal sovereignty over Corfu and kept it until the French Occupation in 1797. Picture - Pontikonisi island is home of the monastery of Pantokrator (Μοναστήρι του Παντοκράτορος). The white staircase of the monastery resembles from afar a (mouse) tail. The island got its name from this architectural (perceptual) quirk: Mouse island. Kerkyra, the "Door of Venice" during the centuries when the whole Adriatic was the Gulf of Venice, remained in Venetian hands from 1401 until 1797, though several times assailed by Turkish naval and land forces and subjected to four notable sieges in 1537, 1571, 1573 and 1716, in which the great natural strength of the city and its defenders asserted itself time after time. 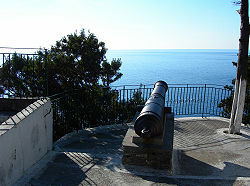 The effectiveness of the powerful Venetian fortifications of the island as well as the strength of some old Byzantine fortifications in Angelokastro, Kassiopi, Gardiki and others, was another strong factor that enabled Corfu to remain the last bastion of free, uninterrupted Greek Christian civilization in the southern Balkans after the fall of Constantinople. Will Durant claims that Corfu owed to the Republic of Venice the fact that it was the only part of Greece never conquered by the muslim Turks. A series of attempts by the Ottoman Turks to take the island began in 1431 when Turkish troops under Ali Bey landed on the island, tried to take the castle and raided the surrounding area, but were repulsed. The Siege of Corfu (1537) was the first great siege by the Ottomans. It began on the 29th August, 1537, with 25,000 soldiers from the Turkish fleet landing and pillaging the island and taking 20,000 hostages as slaves. Despite the destruction wrought on the countryside, the city castle held out in spite of repeated attempts over twelve days to take it, and the Turks left the island unsuccessfully because of poor logistics and an epidemic that decimated their ranks. Thirty-four years later, in August, 1571, Turkish forces returned for yet another attempt to conquer the island. Having seized Parga and Mourtos from the Greek mainland side they attacked the Paxi islands. Subsequently they landed on Corfu's southeast shore and established a large beachhead all the way from the southern tip of the island at Lefkimi to Ipsos in Corfu's eastern midsection. These areas were thoroughly pillaged as in past encounters. Nevertheless the city castle stood firm again, a testament to Corfiot-Venetian steadfastness as well as the Venetian castle-building engineering skills. It is also worth mentioning that another castle, Angelokastro (Greek: Αγγελόκαστρο meaning Angelo's Castle and named for its Byzantine owner Angelos Komnenos), situated on the northwest coast near Palaiokastritsa (Greek: Παλαιοκαστρίτσα meaning Old Castle place) and located on particularly steep and rocky terrain, a tourist attraction today, also held out. These Turkish defeats in the east and the west of the island proved decisive and the Turks abandoned their siege and departed. Two years later Turkish forces repeated their attempt. Coming from Africa after a victorious campaign, they landed in Corfu and wreaked havoc on rural areas a further time. This force's troops were not particularly noted for their discipline, however, so following a counterattack by the Venetian-Corfiot forces they were forced to leave the city by way of the sea. The second great siege of Corfu took place in 1716, during the last Turkish Venetian War. After the conquest of the Peloponnese in 1715, the Ottoman fleet appeared in Butrinto opposite Corfu. On 8 July the Turkish fleet, carrying 33,000 men, sailed to Corfu from Butrinto and established a beachhead at Ipsos. The same day, the Venetian fleet encountered the Turkish fleet off the channel of Corfu and defeated it in the ensuing naval battle. On 19 July, after taking a few outlying forts, the Ottoman army reached the hills around the city of Corfu and laid siege to it. Despite repeated assaults and heavy fighting, the Turks were unable to breach the defences and were forced to raise the siege after 22 days. The 5,000 Venetians and foreign mercenaries, together with 3,000 Corfiotes, under the leadership of Count von der Schulenburg who commanded the defence of the island, were victorious once more. The success is owed in no small part to the extensive fortifications, where Venetian castle engineering had proven itself once again against considerable odds. The repulse of the Ottomans was widely celebrated in Europe, Corfu being seen as a bastion of Western civilization against the Ottoman tide. Today, however, this role is often relatively unknown or ignored, but was celebrated in Juditha triumphans by the Venetian composer Antonio Vivaldi. Picture - Venetian blazons as frequently found on the New Fortress walls. Corfu Town looks very different from most Greek towns, because of Corfu's unique history. From 1386 to 1797, Corfu was ruled by Venetian nobility; much of the town reflects this era when the island belonged to the Republic of Venice, with multi-storied buildings on narrow lanes. Many Venetian-speaking families settled in Corfu during these centuries and until the second half of the 20th century, the Veneto da mar was spoken in Corfu: they were called Corfiot Italians. During this time, the local Greek language assimilated a large number of Italian and Venetian words, many of which are still common today. The Venetian feudal families pursued a mild but somewhat enervating policy towards the natives, who began to adopt some segments of Venetian customs and culture. The Corfiotes were encouraged to enrich themselves by the cultivation of the olive, but were debarred from entering into commercial competition with Venice. Picture - The building of the Ionian Academy. Fully restored after the WWII Luftwaffe bombings. The island served as a refuge for Greek scholars, and in 1732 became the home of the first academy of modern Greece. A Corfu clergyman and scholar, Nikephoros Theotokis (1732-1800) became renowned in Greece as an educator, and in Russia (where he moved later in his life) as an Orthodox archbishop. Many Italian Jews took refuge in Corfu during the Venetian centuries and spoke their own language (Italkian), a mixture of Hebrew-Italian in a Venetian or Apulian dialect with some Greek words. The Venetian influence was important in the development of opera on Corfu. During Venetian rule, the Corfiotes developed a fervent appreciation of Italian opera, which was the real source of the extraordinary (given the conditions in the mainland of Greece) musical development of the island during that era. It was in Venetian times that the town saw the erection of the first opera in Greece, but it was badly damaged during World War II by German artilery. The internationally renowned Venetian-born British photographer Felice Beato is thought to have spent much of his childhood in Corfu. Venetians promoted the Catholic church during their four centuries rule in Corfu. Even if today the majority of Corfiots are Greek Orthodox (following the official religion of Greece), a percentage of Catholics (5%) nevertheless owe their faith to these origins. These contemporary Catholics are mostly families who came from Malta, but also from Italy during the Republic of Venice, and today the Catholic community takes in about 4000 people, (2/3 of Maltese descent) who live almost exclusively in the Venetian "Citadel" of Corfu City, and harmoniously side-by-side with the Orthodox community. Like other native Greek Catholics, they celebrate Easter using the same calendar as the Greek Orthodox church. The island's way of life absorbed Venetian influence in a variety of ways ; its local cuisine, for example, took in such elements and today's Corfiot cooking maintains some of these Venetian delicacies and recipes: "Pastitsada", deriving from the Venetian "Pastissada" (Italian: "Spezzatino") and is the most popular dish in the island of Corfu, "Sofrito", "Strapatsada", "Savoro", "Bianco" and "Mandolato". By the Treaty of Campo Formio, Corfu was ceded to the French, who occupied it for two years as the d�partement Corcyre, until they were expelled by a joint Russian-Ottoman squadron under Admiral Ushakov. For a short time it became the capital of a self-governing federation of the Heptanesos ("Seven Islands"), under Ottoman suzerainty; in 1807 after the Treaty of Tilsit its faction-ridden government was again replaced by a French administration, and in 1809 it was besieged in vain by a British fleet, which had taken all the other Ionian islands. When, by the Treaty of Paris of 5 November 1815, the Ionian Islands became a protectorate of the United Kingdom as the United States of the Ionian Islands, Corfu became the seat of the British Lord High Commissioner of the Ionian Islands. The British commissioners, who were practically autocrats in spite of the retention of the native senate and assembly, introduced a strict method of government which brought about a decided improvement in the material prosperity of the island, but by its very strictness displeased the natives. On 29 March 1864, the United Kingdom, Greece, France and Russia signed the Treaty of London, pledging the transfer of sovereignty to Greece upon ratification. Thus, on 28 May, by proclamation of the Lord High Commissioner, the Ionian Islands were united with Greece. During the First World War, the island served as a refuge for the Serbian army that retreated there on Allied forces' ships from a homeland occupied by the Austrians and Bulgarians. During their stay, a large portion of Serbian soldiers died from exhaustion, food shortage, and different diseases. Most of their remains were buried at sea near the island of Vido, a small island at the mouth of Corfu port, and a monument of thanks to the Greek nation has been erected at Vido by the grateful Serbs; consequently, the waters around Vido Island are known by the Serbian people as the Blue Graveyard (in Serbian, Плава Гробница, Plava Grobnica), after a poem written by Milutin Bojić after World War I. 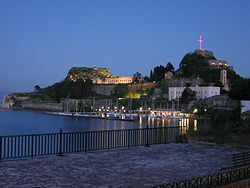 During the Greco-Italian War, Corfu was occupied by the Italians in April 1941. 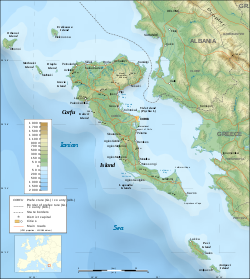 They administered Corfu and the Ionian islands as a separate entity from Greece until September 1943, following Benito Mussolini's orders of fulfilling Italian Irredentism and making Corfu part of the Kingdom of Italy. During the Second World War the 10th infantry regiment of the Greek Army, composed mainly of Corfiot soldiers, was assigned the task of defending Corfu. The regiment took part in Operation Latzides, which was a heroic but ultimately unsuccessful attempt to stem the forces of the Italians. After Greece's surrender to the Axis, the island came under Italian control and occupation. On the first Sunday of November 1941, high school students from all over Corfu took part in student protests against the occupying Italian army ; these student protests of the island were among the first acts of overt popular Resistance in occupied Greece and a rare phenomenon even by wartime European standards. Subsequently, a considerable number of Corfiots escaped to Epirus in mainland Greece and enlisted as partisans in ELAS and EDES, in order to join the resistance movement gathering in the mainland. Upon the fall of Italian fascism in 1943, the Nazis moved to take control of the island. On 14 September 1943, Corfu was bombarded by the Luftwaffe; these bombing raids destroyed churches, homes, whole city blocks, especially in the Jewish quarter Evraiki, and a number of important buildings, such as the Ionian Parliament, the Municipal Theatre, the Municipal Library and others. The Italians capitulated, and the island came under German occupation. Corfu's mayor at the time, Kollas, was a known collaborator and various anti-semitic laws were passed by the Nazis that now formed the occupation government of the island. In early June 1944, while the Allies bombed Corfu as a diversion from the Normandy landings, the Gestapo rounded up the Jews of the city, temporarily incarcerated them at the old fort (Palaio Frourio), and on 10 June sent them to Auschwitz, where very few survived. Approximately two hundred out of a total population of 1,900 escaped. Many among the local population at the time provided shelter and refuge to those 200 Jews that managed to escape the Nazis. A prominent section of the old town is to this day called Evraiki (Εβραική, meaning Jewish quarter) in recognition of the Jewish contribution and continued presence in Corfu city. An active synagogue (Συναγωγή) with about 65 members (who still speak their original Italkian language) is an integral part of Evraiki currently. Picture - Douglas' column at the suburb of Garitsa. Built to commemorate Howard Douglas. Corfu was liberated by British troops, specifically the 40th Royal Marine Commando, which landed in Corfu on 14 October 1944, as the Germans were evacuating Greece. The Royal Navy swept the Corfu Channel for mines in 1944 and 1945, and found it to be free of mines. A large minefield was laid there shortly afterwards by the newly-communist Albania and gave rise to the Corfu Channel Incident. This incident led to the Corfu Channel Case, where the United Kingdom opened a case against the People's Republic of Albania at the International Court of Justice. After World War II and the Greek Civil War, the island was rebuilt under the general programme of reconstruction of the Greek Government (Ανοικοδόμησις) and many elements of its classical architecture remain. Its economy grew but a portion of its inhabitants left the island for other parts of the country; buildings erected during Italian occupation - such as schools or government buildings - were put back to civic use. In 1956 Maria Desylla Kapodistria, relative of first Governor of Greece Ioannis Kapodistrias, was elected mayor of Corfu and became the first female mayor in Greece. The Corfu General Hospital was also constructed; electricity was introduced to the villages in the 1950s, the radio substation of Hellenic Radio in Corfu was inaugurated in March 1957, and television was introduced in the 1960s, with internet connections in 1995. The Ionian University was established in 1984. Recently, due to perceived neglect of Corfu by the central government in Athens, local businessmen and others are proposing formation of an autonomist party to compete in the 2010 local elections. Aside from being a leading centre for the Fine Arts, Corfu is also the home of the Ionian Academy, an institution carrying through and strengthening the tradition of Greek education while the rest of Greece was still fighting Turkish occupation. The people of Corfu have in various historical contexts acted as a Western bulwark. In the modern era, beginning with its massive student protests during World War II against fascist occupation, and continuing in the fight against the dictatorship of Georgios Papadopoulos (1967-1974), students in Corfu have played a vanguard role in protesting in favour of freedom and democracy in Greece, setting themselves against both internal and external oppression. For Corfiotes a recent example of such heroism is that of geology student Kostas Georgakis, who set himself ablaze in Genoa, Italy on 19 September 1970, in a protest against the Greek military junta of 1967-1974. 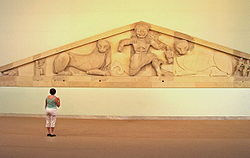 Picture - The Gorgon just before being beheaded by Perseus, as depicted on a pediment from the Artemis Temple on display at the Archaeological Museum of Corfu. The Archaeological Museum, inaugurated in 1967, it was constructed to house the exhibit of the huge Gorgon pediment of the Artemis temple, excavated at Palaiopolis in early 20th century. In 1994, two more halls were added to the museum, where new discoveries from the excavations of the ancient town and the Garitsa cemetery are exhibited. Byzantine Museum of Antivouniotissa, a church converted into a museum featuring rare Byzantine art. The Banknotes museum, located in Aghios Spyridon square, features a complete collection of Greek banknotes from independence to the adoption of the euro in 2002. The Museum of Asian art of Corfu is located at the Palaia Anaktora (mainly Chinese and Japanese Arts); its unique collection is housed across 15 rooms, taking in over 12,000 artifacts, including a Greek Buddhist collection that shows the influence of Alexander the Great on Buddhist culture as far as Pakistan. The Serbian Museum of Corfu (Serbian: Српска кућа, Serbian House)houses rare exhibits about the Serbian soldiers' tragic fate during the First World War. 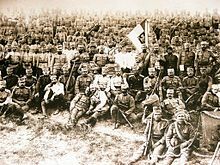 The remnants of the Serbian Army of about 150,000 soldiers together with their government in exile, found refuge and shelter in Corfu, following the collapse of the Serbian Front as a result of the Austro-Hungarian attack of the 6 October 1915. Exhibits include photographs from the three years stay of the Serbians in Corfu, together with other exhibits such as uniforms, arms and ammunition of the Serbian army, Serbian regimental flags, religious artifacts, surgical tools and other decorations of the Kingdom of Serbia. Saint Spyridon the Thaumaturgist (Miracle-worker, Greek: Ο Θαυματουργός), also referred to as Αγιος Σπυρίδων ο πολιούχος (translated as Saint Spyridon the Keeper of the City), is the patron saint of the island. St. Spyridon is revered for the miracle of expelling the plague (πανώλη) from the island, amongst many other miracles attributed to him. It is believed by the faithful that on its way from the island the plague scratched one of the fortification stones of the old citadel to indicate its fury at being expelled ; St. Spyridon is also attributed the role of saving the island at the second great siege of Corfu of 1716. Its legend ran that the sight of St. Spyridon approaching turkish forces bearing a flaming torch in one hand and a cross in the other, had caused panic. This miracle is one of the earliest successful examples of psychological operations in warfare (psyops). This victory over the Ottomans, therefore, was attributed not only to the leadership of Count Schulenburg who commanded the stubborn defence of the island against Turkish forces, but also to the miraculous intervention of St. Spyridon. Venice honoured von der Schulenburg and the Corfiots for successfully defending the island. Recognizing St. Spyridon's role in the defence of the island Venice legislated the establishment of the litany (λιτανεία) of St Spyridon on the 11th of August as a commemoration of the miraculous event, inaugurating a tradition that continues to this day. In 1716 Antonio Vivaldi, on commission by the republic of Venice, composed the oratorio Juditha triumphans to commemorate this great event. Juditha triumphans was performed in November 1716 in Venice by the orchestra and choir of the Ospedale della Pietx� and is described as Vivaldi's first great oratorio. Picture - A marching band from Austria, a frequent visitor, through the Corfu landmark of Liston (it). In the background the western arch of Palaia Anaktora. Corfiote musical tradition is significant. In the past, people would join in the singing of cantx�des (Greek: καντάδες), impromptu choral songs in two, three or four voices, usually accompanied by a guitar. Nowadays, in the face of rigours of a modern life from which Corfiote society has not been spared, cantx�des (from the Italian verb cantare, to sing) are only performed by semi-professional or amateur singers, often as attractions for visitors. the Philharmonic Society of Corfu use dark blue uniforms with dark red accents, and blue and red helmet plumes. It is usually called the Old Philharmonic or simply the Palix� ("Old"). Founded September 12, 1840.
the Mantzaros Philharmonic Society use blue uniforms with blue and white helmet plumes. It is commonly called the N�a ("New"). Founded October 25, 1890.
the Capodistria Philharmonic Union use bright red and black uniforms and plumes. It is commonly called the Cx�nte Capodx�stria or simply the Cx�nte ("Count"). It is the juniormost of the three (founded April 18, 1980). The bands give regular summer weekend promenade concerts at the Spianada Green "px�lko", and have a prominent part in the yearly Holy Week ceremonies. A considerable but mostly friendly rivalry between them persists, and each rigorously adhere to their respective repertoires. Every time one of these bands passes in front of the building housing another, they stop and give a musical "salute" to their rival. While this is officially a sign of respect, it is actually a challenge meant to show off to the rivals and impress them with a display of superior musicianship. On Good Friday, from the early afternoon onward, the bands of the three Philharmonic Societies, separated into squads, accompany the Epitaph processions of the town churches. Late in the afternoon, the squads come together to form one band in order to accompany the Epitaph procession of the cathedral, while the funeral marches that the bands play differ depending on the band ; the Old Philharmonic play Albinoni's Adagio, the Mantzaros play Verdi's Marcia Funebre from Don Carlo, and the Capodistria play Chopin's Funeral March and Mariani's Sventura. On Holy Saturday morning, the three town bands again take part in the Epitaph processions of St. Spyridon Cathedral in procession with the Saint's relics. At this point the bands play different funeral marches, with the Mantzaros playing Miccheli's Calde Lacrime, the Palia playing Marcia Funebre from Faccio's Amleto, and the Capodistria playing the Funeral March from Beethoven's Eroica. This custom dates from the 19th century, when colonial administrators banned the participation of the British garrison band in the traditional Holy Friday funeral cortege. The defiant Corfiotes held the litany the following morning, and paraded the relics of St. Spyridon too, so that the administrators would not dare intervene. The litany is followed by the celebration of the "Early Resurrection"; balconies in the old town are decked in bright red cloth, and Corfiotes throw down large clay pots (the bx�tides, μπότηδες) full of water to smash on the street pavement, especially in wider areas of Liston (it) and in an organised fashion. This is enacted in anticipation of the Resurrection of Jesus, which is to be celebrated that same night, and to commemorate King David's phrase: "Thou shalt dash them in pieces like a potter's vessel" (Psalm 2:9). Once the bx�tides commotion is over, the three bands parade the clay-strewn streets playing the famous "Graikox�" festive march. This legendary march, the anthem of the island, was composed during Venetian rule, and its lyrics urged: "Greeks, never fear, we are all enslaved: you to the Turks, we to the Venetians, but one day we shall all be free". The Venetians were replaced by the French and the French by the British, and both the lyrics and the performance of the march were officially banned. The bands, however, defiantly played it on the Eve of Easter, as a token of the resurrection of the nation, and the tradition is honored to this day. While much of present-day Greece was under Ottoman rule, the Ionian Islands enjoyed a Golden Age in music and opera. Corfu was the capital city of a prized Venetian colony and it benefited from a unique musical and theatrical heritage. Then in the 19th century, as a British Protectorate, Corfu developed a musical heritage of its own and which constitutes the nucleus of modern Greek musical history. Until the early 18th century, musical life took place in town and village squares, with performances of straight or musical comedies - known as Momaries or Bobaries. From 1720, Corfu became the possessor of the first theatre in post-1452 Greece. It was the Teatro San Giacomo (now the Town Hall) named after the nearby Roman Catholic cathedral (completed in 1691). Picture - The new municipal theatre. In Venetian rule, the Corfiotes developed a fervent appreciation of Italian opera, which was the real source of the extraordinary (given conditions in the mainland of Greece) musical development of the island during this era. The opera house of Corfu during 18th and 19th century was that of the Nobile Teatro di San Giacomo, named after the neighbouring catholic cathedral, but the theatre was later converted into the Town Hall. It was both the first theatre and first opera house of Greece in modern times and the place where the first Greek opera, Spyridon Xyndas' "The Parliamentary Candidate" based on an exclusively Greek libretto was performed. A long series of local composers, such as Nikolaos Mantzaros, Spyridon Xyndas, Antonio Liberali, Domenico Padovani, the Zakynthian Pavlos Carrer, the Lambelet family, Spyridon Samaras, and others, all developed careers intertwined with the theatre. San Giacomo's place was taken by the Municipal Theatre in 1902, which maintained the operatic tradition vividly until its destruction during World War II as a result of a 1943 German air raid. The first opera to be performed in the San Giacomo was in 1733 ("Gerone, tiranno di Siracusa"), and for almost two hundred years, between 1771 and 1943, nearly every major opera from the Italian tradition, as well as many others from Greek and French composers, were performed at the stage of the San Giacomo; this impressive tradition, invoking an exceptional musical heritage, continues to be reflected in Corfiote operatic mythology, a fixture in famous opera singers' itineraries. Picture - The Municipal Theatre of Corfu, which in early 20th century replaced the legendary Nobile Teatro di San Giacomo. This photograph shows the theatre prior to the 1943 Luftwaffe bombardment and its subsequent destruction during World War II. The Municipal Theatre of Corfu (Greek: Δημοτικό Θέατρο Κέρκυρας) became the main theatre and opera house in Corfu, Greece since 1902. The theatre was the successor of Nobile Teatro di San Giacomo di Corfx� which became the Corfu city hall. It was destroyed during a Luftwaffe aerial bombardment in 1943. Since the early 1990s a music department has been established at the Ionian University. Aside from its academic activities, concerts in Corfu and abroad, and musicological research in the field of Neo-Hellenic Music, the Department organizes an international music academy every summer , which gathers both international students and professors specialising in brass, strings, singing, jazz and musicology. Another venerable Corfu tradition is known as the Carnival or Ta Karnavalia. Venetian in origin, festivities include a parade featuring the main attraction of Karnavalos, a rather grotesque figure with a large head and smiling face , leading a diverse procession of colourful floats. Corfiots, young and old, dress up in colourful costumes and follow the parade, spilling out into the area's narrow streets (kantounia) and spreading the festivities across the city, dancing and socialising. At night, in the island's more sophisticated social circles, dance and costume parties are traditional. Picture - The Garden of the People at Palaia Anaktora from the sea. The spiral staircase is visible on the left. Kontrafossa and the bridge to Palaio Frourio on the left of the picture. It is in Corfu that Hercules, just before embarking on his ten labours, slept with the Naiad Melite ; she bore him Hyllus, the leader of the Heraclids. British naturalist Gerald Durrell wrote three well-loved books about his 1935-1940 childhood on Corfu: My Family and Other Animals; Birds, Beasts and Relatives; and The Garden of the Gods. His brother, literary author Lawrence Durrell, also wrote a volume about Corfu: Prospero's Cell: A Guide to the Landscape and Manners of the Island of Corcyra (Corfu). A number of cinema productions have been filmed in Corfu, including the 1981 James Bond movie, For Your Eyes Only. The most memorable scene of the film to be bound with the island is of the underwater ancient Greek temple, with a huge turtle swimming in front of the camera; a casino scene was also filmed at the Achilleion. Other scenes filmed here include those tracing 'Melina' and James' walk through the town's streets, and Melina being greeted by Bond at Pontikonisi island. The film's scene depicting a Greek wedding was filmed at the Bouas-Danilia traditional village (Μπούας Δανίλια παραδοσιακό χωριό). Action scenes were also filmed at Neo Frourio. Corfu is also the setting of a 1987 BBC TV series version, and a 2005 BBC movie version, of My Family and Other Animals, Gerald Durrell's book about his childhood in Corfu in the late 1930s. Corfu is one of the locations in the legend of Simon and Milo, where Simon falls in love temporarily. It is the setting of the 1998 song Mediterranean Lady by Prozzak. The island is alluded to several times in David Foster Wallace's The Broom of the System. Picture - The famous beach at Canal D'Amour, Sidari on a windy day. At the entrance of the bay there is an opening in the rock at the right (centre left of picture) that continues to the other side, a natural tunnel. This sea channel gave the beach its name: Canal D'Amour, French for channel of love. Corfiotes have a long history of hospitality to foreign residents and visitors, typified in the twentieth century by Gerald Durrell's childhood reminiscence My Family and Other Animals. The North East coast has largely been developed by a few British holiday companies, with large expensive holiday villas. Package holiday resorts exist on the north and east coasts. Picture - A mountain road in northwestern Corfu. Corfu has ferry services both by traditional ferries to Gaios in the island of Paxoi and as far as Patras and both traditional ferries and advanced retractable airfoil, hydrodynamic-flow, high-speed ferries called Flying Dolphins to Igoumenitsa and Sarandx� in neighbouring Albania. The small port of Lefkimmi is also to be found at the southernmost tip of the island on Cape Kavos, offering a ferry service to the mainland. The buses to the main places on the island run about six times a day between the city and Glyfada, Sidari, Pleokastritsa, Roda and Acharavi, Lefkimmi, Lefkimmi and Piri. Other coaches drive up to twice a day to Athens and Thessaloniki. City buses run through the city to the Achilleon, Gouvia, Afra, Pelekas and some other places of interest. There are no public buses to the airport. Picture - Shipping traffic near Corfu harbour. Vido island is in the foreground with the Albanian coast line in the background. Corfu is mostly planted with olive groves and vineyards and has been producing olive oil and wine since antiquity. The main wine grape varietals found in Corfu are the indigenous white Kakotr�gēs and red Petrokx�ritho, the Cefalonian white Robx�la, the Aegean Moschx�to (white muscat), the Achaean Mavrodx�phnē and others. Modern times have seen the introduction of specialist cultivation supported by the mild climate, like the kumquat and bergamot oranges, which are extensively used in making spoon sweets and liqueurs. Corfu also produces local animal products, such as Corfiote gravi�ra (a variant of gruyere) and "Corfu" cheese (a variant of Grana); "Corfu butter" (Box�tyro Kerk�ras), an intensely flavored cooking and baking butter made of ewe's milk; and the nox�mboulo salami made of pork and lard and flavored with orange peel, oregano, thyme and other aromatic herbs, which are also burned for smoking. Local culinary specialties include sofrito (a veal rump roast of Venetian origin), pastitsx�da (bucatini pasta served with diced veal cooked in a tomato sauce), bourd�tto (cod cooked in a peppery sauce), mx�ndoles (caramelized almonds), past�li (honey bars made with sesame, almonds or pistacchios), mandolx�to (a "past�li" made of crushed almonds, sugar, honey and vanilla), and tzitzibx�ra, the local ginger beer, a remnant of the British era. 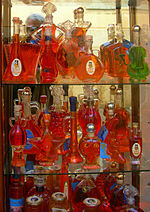 The island has again become an important port of call and has a considerable trade in olive oil. In earlier times there was a great export of citron, which was cultivated here. Maria Desylla Kapodistria, relative of Ioannis Kapodistrias, mayor of Corfu and first female mayor of Greece. This article incorporates text from a publication now in the public domain: Chisholm, Hugh, ed (1911). Encyclopx�dia Britannica (Eleventh ed.). Cambridge University Press.